This summer the Rijksmuseum is featuring an extraordinary exhibition of Dutch micro-carvings from the late Middle Ages. Christine Medycky has been finding out about ‘Small Wonders: Gothic Boxwood Miniatures,’ – a testament to human creativity and ingenuity. 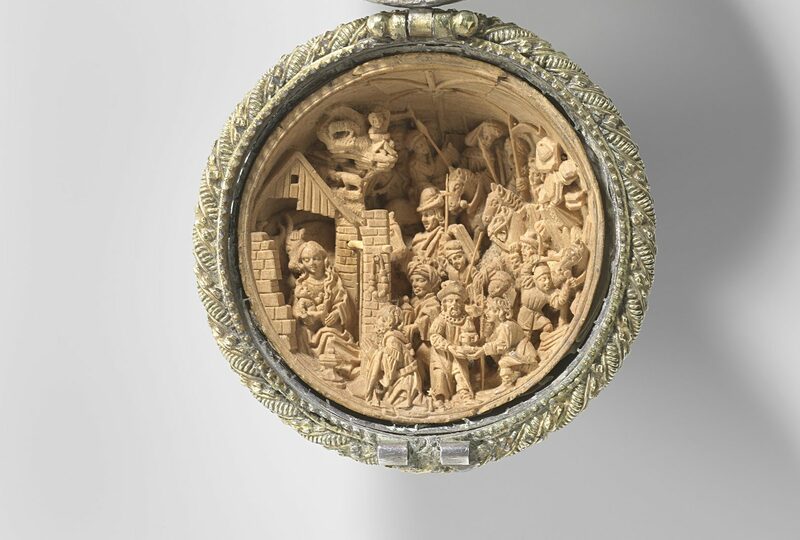 The exhibition which brings together for the first time from private collections and museums around the world, is made up of more than 60 rare miniature boxwood devotional objects from the 16th century. These include rosaries, prayer beads, altarpieces, engraved plaques, prayer pods and even some memento mori in the form of skulls and coffins. In an unprecedented collaboration, curators and conservationists from the Art Gallery of Ontario (Toronto), the Metropolitan Museum of Art (New York) and the Rijksmuseum (Amsterdam), joined forces to investigate the long-standing mystery of how these tiny masterpieces were made and by whom. What their five years of research uncovered is fascinating. The production of small devotional instruments in Europe coincided with the rise of private devotion between 1475 and 1525. Boxwood was considered the ideal medium for carving such intricate miniatures. Common to Europe, this hard and dense wood has a uniform and fine grain that polishes well. Moreover, boxwood was considered to be a sacred wood, symbolic of humility and salvation. The most important private devotional aid was the rosary. While the Cult of the Virgin originated in the 5th century, it was not until the 15th century that the Rosary was standardised to ‘an alternating repetition of one Our Father and ten Ave Marias, each related to a Christian mystery’. The Dominican Order popularised the devotional practice by establishing confraternities that were not only accessible to men and women, but also to all levels of society. Soon the Rosary proliferated throughout Europe. 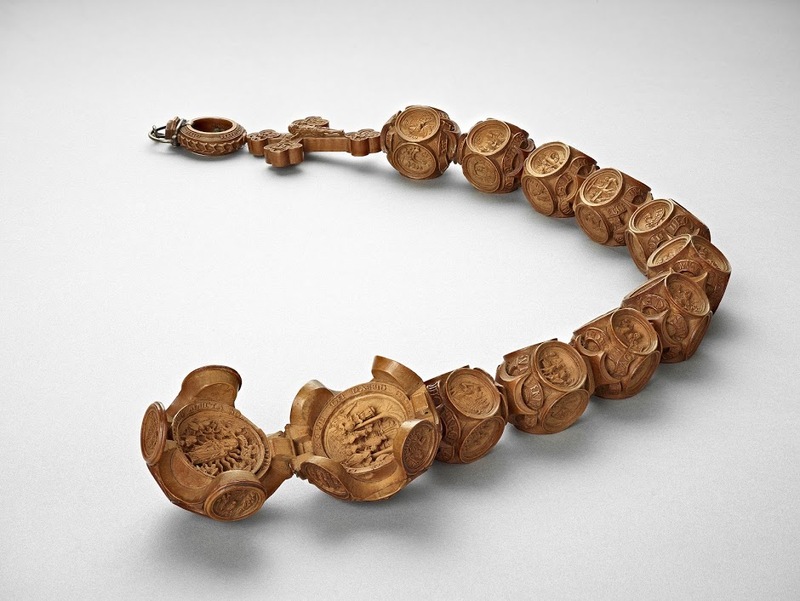 Small Wonders features a number of rosaries and prayer beads, including the magnificent Chatsworth Decade Rosary that belonged to King Henry VIII and his first wife, Catherine of Aragon. The beads are small – the size of a hazelnut, walnut or small fruit and fit easily into one’s palm. Rosaries of course, were carried in the hand or suspended from a belt for easy reach. The power of the Rosary can be attributed to the fact that it is the only devotional aid that appeals to both the sense of touch and sight. According to the Senior Curator of Sculpture at the Rijksmuseum, Frits Scholten, reciting the rosary was ‘a complex sensorial affair that comprised a tactile element…but also an imaginative and mnemonic one’. The constant handling of the beads liberated the mind, while gazing at images facilitated meditation. The great theologian St. Augustine considered sight to be the most important of the senses. ‘To see’ he stated, is ‘to know’ and to know is ‘to understand’. These carvings themselves are so microscopic in scale that it is impossible for the naked eye to make out all of their intricacies. In order to examine the boxwood miniatures more closely, curators and conservators turned to cutting-edge technology for help. High-resolution Micro CT scanning, 3D animations and photography revealed the most-minute details of these tiny treasures. In the Mass of St. Gregory narrative of the Chatsworth paternoster beads, for example, the research team discovered a man and a woman hidden behind a column in the gallery of the Church observing the Eucharist below. The Royal Arms of England and initials carved on the exterior of the prayer-nut suggest that the couple in question was in fact King Henry VIII and Catherine of Aragon. The most vivid and moving details are found in the Passion of Christ narratives. When the viewer sees the subtleties up close – the agony of Jesus carrying the cross, the brutality of the Roman soldiers and the mockery of the crowds – it is extremely moving. It is as if we enter into the story and experience it ‘here and now’. Indeed, at the Small Wonders exhibition viewers can immerse themselves into and explore the micro-spectacle, with the help of virtual reality. Advanced technology has also assisted the research team to uncover the secret of how these micro-carvings were made. Paternoster beads open up into two halves like a prayer book, each half telling a story. Through virtual deconstruction researchers discovered that the interior of the prayer beads was carved from a single disc of boxwood in low relief or from a number of discs layered on top of each other in order to produce the effect of depth; these discs were then secured by tiny wooden pins or other means. Such complexity in design and construction attest to an unparalleled technical virtuosity. Indeed, gothic boxwood miniatures were extremely valuable and considered luxury items – ‘Rolexes’ of the day, prized possessions of royalty and noblemen. In addition to Henry VIII, Louis XI, Emperor Charles V and Archduchess of Austria either commissioned or owned boxwood devotional objects. Who made these masterpieces? The only clue found to date is a Latin inscription on the exterior of one prayer bead that reads: ‘Adam Theordici (Dirksz) made me’. Whether Adam is its creator or patron is unclear. Scholars believe that Adam, if indeed he was the responsible craftsman, was not a sole actor, but a member of a guild specialising in boxwood carving. Research indicates his studio was not in the Southern Netherlands, as was long assumed, but must have been in the north, possibly in Delft. Whoever made these tiny miracles it is clear that the craftsman-artist had an excellent grasp of geometry, hyper-concentration, very good eyesight, steady hands, and unwavering patience. Small Wonders: Gothic Boxwood Miniatures will run in the Philips Wing of the Rijksmuseum until September 17, 2017.